Mr. Ernest Lamb is happily married and has been married for twenty-nine years to his beautiful wife Pamela. What he does in his spare time is spend time with his first love, his wife Pamela, and his second love which is fishing. 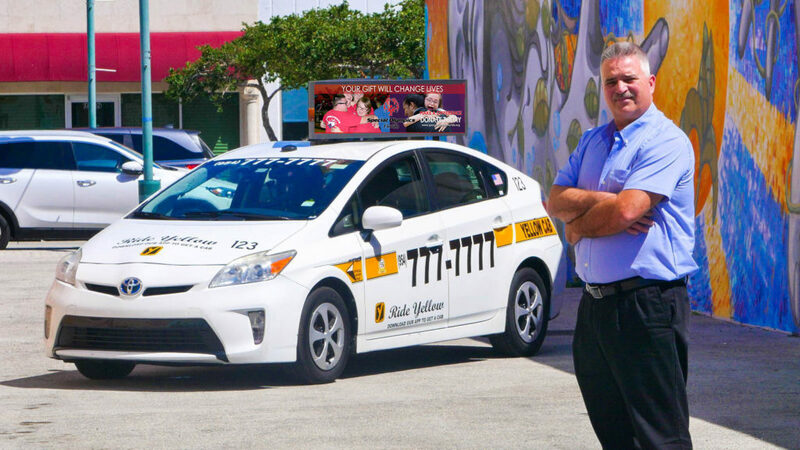 He is originally from Walterboro South Carolina and has been with Yellow Cab for three years. He exemplifies what customer service is to each customer he comes in contact with, as well as with his fellow drivers. We always receive positive taxi feedback or call in on him. He loves the interaction and helping his passengers. He can recall picking up a passenger that he transported from a Day Care facility for the elderly. The customer was very confused on where they lived, even though Mr. Lamb had the address he did not have the apartment number. Mr. Lamb then took it upon his self to contact dispatch and find out what apartment they lived in. They had to contact the Elder day care to find out the apartment number. In doing so, Mr. Lamb personally insured that they were in their apartment where there daughters were. She was so appreciative that he took the initiative to instead of just dropping them off he insured that they got home safely. In addition, there is an elderly man that he picks up at least three times a week who is a retired Navy Veteran who only wants Mr. Lamb to transport him. Mr. Lamb has several passengers like this who he prides and dedicated himself to ensuring that he is there to transport them to Doctor’s Appointment, chemo therapy to veterans hospital, and to the veterans lodge. He is the true epitome of what is called to be friendly, professional and courteous.